The start of Part 5 of this photo series is also the beginning of a new chapter: it’s when the road trip began. Starting on November 16th and ending on December 1st, this trip spanned 5000 miles, four countries, and 16500 feet of elevation. I’m not going to spoil the specifics of what we saw (you’ll have to keep reading! ), but you’ll want to stay tuned for photos of some of the most other-worldly scenery on Earth. Eventually. One thing that I was looking forward to while on the road is that it would be a really great chance to see parts of the world which don’t get often photographed. The first week of my trip, though great, felt very rehearsed. Artificial isn’t the right word to describe it, but there was still an absence of adventure. My flawed, clumsy Spanish was fine because everybody also spoke English in the tourist traps. By getting into the smaller cities and, eventually, off the beaten/paved path, we’d get a dose of South America like few tourists get to see. A quick note: the overall quality of photos is likely to diminish during the road trip portion of the trip, since in a lot of cases, the car was moving. On this trip I did not drive, so you don’t need to worry about that portion of things. However, for a lot of these pictures, there will be a windshield in the way. Windshields are hard to photoshop out! We still got out of the car for the biggest highlights, though, as you’ll see in this part. Before the road trip could begin in earnest, we had to overcome a rocky start. On the train ride back from Machu Picchu, I developed a case of altitude sickness and was in poor shape by the time I reached Cusco. Jake, who joined me for the driving part of the trip, drove from La Paz (where the car was rented) to Cusco in one day. He made it, though not after a border crossing that took multiple hours. However, upon arriving in Cusco, it took him several hours to find my hotel because he got horribly lost. His phone wasn’t working, and the Peruvian method of signing cities is “don’t worry about signs, you’ll figure it out.” When he finally found the hotel, they told him to go park somewhere else because it wasn’t safe. After being unable to find a parking spot, Jake got reservations in a new hotel with a private garage, and proceeded to get horribly lost again. He was also sick, due to altitude and dehydration. We were supposed to leave Cusco at 6AM. We left closer to 11. However, the extra rest helped, and we were both in much better shape when we hit the road. In this leg of the trip we were originally planning on driving up to Huascaran National Park, in the northern part of the country. However, our first discussion over the same map in person eliminated that portion of the plan in order to make time for destinations further south. This turned out to be the correct decision. Despite cutting a portion of the trip, we calculated that we still had a few days to drive around in Peru before heading south to Bolivia, so we decided to take a mountainous path to start. We took off from Cusco heading almost due west, and we continued in that general direction until we hit the ocean. This photo is from the first major town we ran into, called Anta. Anta gave us our first taste of what would become our driving nemesis: the tuk-tuk. Tuk-tuks are disallowed from the larger cities in Peru, but they’re extremely common in smaller towns. They also add chaos to a driving style that’s already full of it. They’re extremely aggressive, but at the same time they’re very slow. It’s a lot to keep track of. 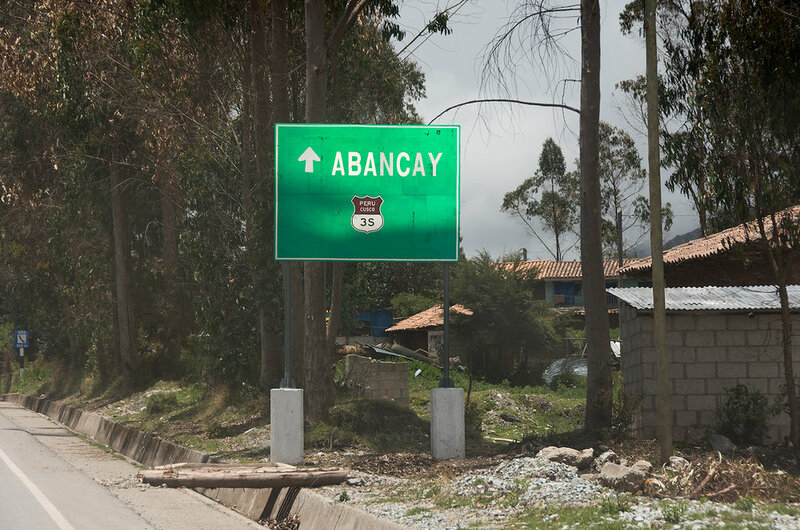 This sign shows the road we chose at the beginning of the drive, Peru Highway 3S. 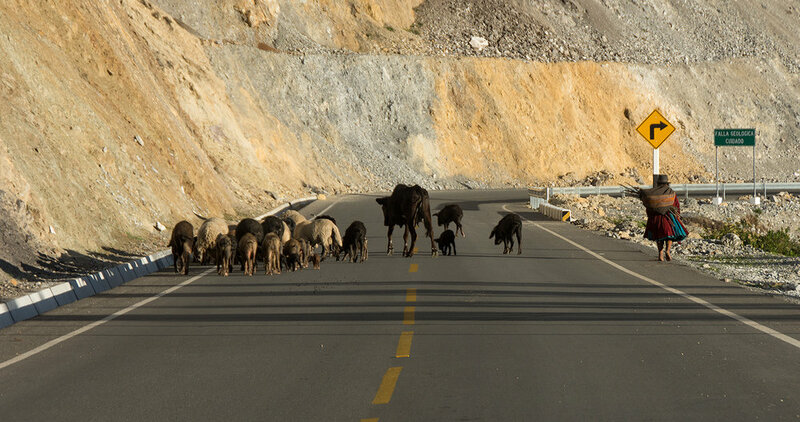 Route 3 is a paved road that runs along the foothills of the Andes, from the Bolivian border to an area near the Ecuadorian border. 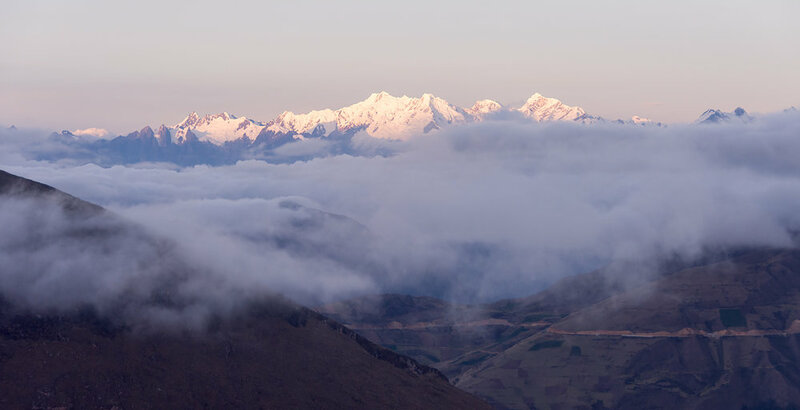 We were originally going to take it all the way to Huascaran, but the plan change meant we were going to take it to the city of Ayacucho instead. Abancay is the largest city between Cusco and the junction point. Immediately after Anta, the road climbs up to its first mountain pass, the very green Abra Huillque. At 12200 feet, this pass was child’s play compared to what we’d face over the coming days, but it did give some spectacular views of the farmland below. A lot of the roads in this part of Peru are extremely hilly, a series of cresting ridges and descending valleys. After our first pass at over 12000 feet, we quickly descended back to 7000 or so. Things weren’t any less green down here. A typical scene of rural Peru. Dogs? Check. Twisty road through the mountains? Check. Political propaganda painted onto the side of a building? Check. Peru’s presidential election is coming up in April, and as a result a large numbers of buildings are painted in support of the dozens (!) of candidates. As we wound our way through the valleys of Curahuasi, a ridge of high peaks was occasionally visible to our north. Incidentally, Machu Picchu’s valley is located on the other side of these peaks, some of which were visible on the train ride to Aguas Calientes. This stretch was one of the only times during the trip when we saw proper snow caps, and they were excellent foreshadowing for photos to come later that evening. Another common sight in rural Peru: farmers taking their animals for a walk. This cluster had pigs, sheep, and a cow. Apparently they get along. Going up! At this point, we were ascending towards Abra Huayllaccasa, our first time reaching 4100 meters (13451 feet) on the trip. Route 3 contains some very impressive road engineering, including massive rock cuts like this one. One striking part of these mountain passes is that sometimes the summits are in the clouds, literally. As the sun was setting on the first day, we had to pierce through these clouds to continue. We got above the clouds at just the right time, getting to see the amazing light and the even-more-amazing mountains. This range is called the Cordillera Willkapampa, important because it separates Cusco, Machu Picchu, and the passes we were driving over. Featured in the center of this photo, glowing bright, is the peak Salcantay, which towers over 20500 feet above sea level. The Incans at Machu Picchu worshiped it as a deity. The light faded, but the good views didn’t. We adjusted positions just as the fog started to roll over the nearby hills. It was breathtaking, as much as your breath can be taken at this altitude. That’s it for the photos from the first day of the road trip. We crossed through Andahuaylas, drove about 10 more miles, then stopped for a well-earned sleep in the car. We only managed to make it 340 km (~210 miles), but we couldn’t have asked for a better scenic start to our journey.